Indian Space Research Organisation (ISRO), Department of Space Centres / Units published notification for recruitment for Scientist / Engineer posts in Electronics, Mechanical & Computer Science Branch. Educational Qualification: BE / B.Tech or equivalent qualification in first class with an aggregate minimum of 65% marks (average of all semesters for which results are available) or CGPA 6.84 on a ten scale. Minimum of 65% marks or CGPA 6.84 in section B alone for candidates with AMIE/Grad IETE qualification. Candidates who are going to complete the above course in the academic year 2015-16 are also eligible to apply provided final Degree is available by 31/8/2016. Application Fee: There will be an Application Fee of Rs. 100/- (Rupees One Hundred Only) for each application. Women candidates/Scheduled Castes (SC)/ Scheduled Tribes (ST); Ex-servicemen [EX] and Persons with Disabilities (PWD) candidates are exempted from payment of Application Fee. Selection Process: Based on the performance in the Written Test, candidates will be short-listed for interview. Written test is only a first level screening and written test score will not be considered for final selection process. Final selection will be based on the performance of the candidates in the Interview and those who secure minimum 60% marks in the interview will be eligible for consideration for empanelment in the selection panel, in the order of merit. Written Test Centre: The written test will be conducted on 03/07/2016 at ten venues viz., Ahmedabad, Bengaluru, Bhopal, Chennai, Guwahati, Hyderabad, Kolkata, Mumbai, New Delhi and Thiruvananthapuram. However, the Organisation reserves the right to cancel/change the written test venue and re-allot the candidates to any other test centre. The call letters for the written test to the short- listed candidates will be sent only by e-mail during the last week of June 2016. 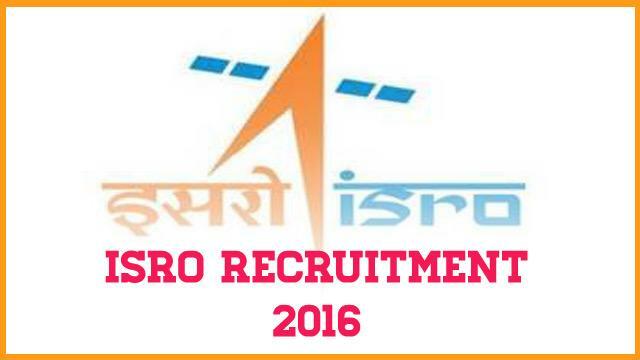 How to apply: Interested candidates will be apply online through website www.isro.gov.in. and send hard copies to given below address.